If you’re an animal lover and you live in the Southwest, you’re probably familiar with the stunning work of photographer Norah Levine. An instructor at the Santa Fe Photographic Workshops, she specializes in pet and family portraiture. 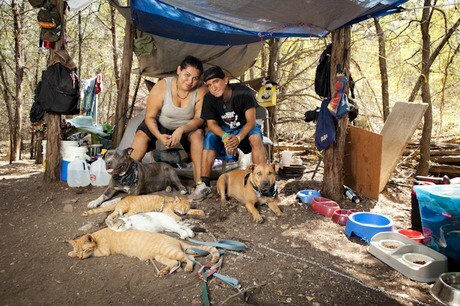 In 2012 Levine embarked on an endeavor — an exploration of the homeless of Austin, Texas and their companion animals — that’s drawing national attention. The project was called Lifelines, and it featured interviews with and images of the city’s often-forgotten dog and cat guardians. DogTime: One of the purposes of the project is to highlight the bond between humans and animals. Why did you specifically choose the homeless? Norah Levine: The Lifelines project idea came about when I learned about Animal Trustees of Austin’s 4PAWS Program (For People and Animals without Shelter). 4PAWS was established by ATA to provide free of charge wellness care and spay/neuter surgeries to pets belonging to the homeless population of Central Texas and beyond. I was immediately drawn to the idea. But not in a sad way. I was pulled toward the hope that lay in portraying the genuine love that exists between owner and companion. DT: Are you working with anyone else on this project? NL: Gabrielle Amster is an integral part of this project. She is a staff member at Animal Trustees of Austin and helped coordinate many of the photo shoots while providing outreach for the 4PAWs program. She also conducted interviews which will be part of the Lifelines exhibit. DT: How difficult (or easy) was it to approach your subjects and gain permission to capture their stories on film? NL: Some of the people and animals we worked with were existing clients of the 4PAWS program so there was a certain amount of trust initiated. Some subjects were found by word of mouth over time as well as through other organizations serving the homeless community in Austin. The majority of the people we met were more than willing to participate and were very excited to share the importance of their relationship with their pet via the photographs and interviews. DT: What were the biggest surprises or most eye-opening experiences of the project? NL: I had very limited experience with homeless people before starting this project. I can honestly say that this project has reminded me that everyone has a unique situation that deserves to be considered. Each person we met has a different story – but they all love their pets like family members. I had hoped this would be the case, but I didn’t know for sure. I think what most surprised me was how much of a priority the animals are to the people we photographed and interviewed. DT: I know you’ve photographed companion animals for years. Was this project different, and if so, how? 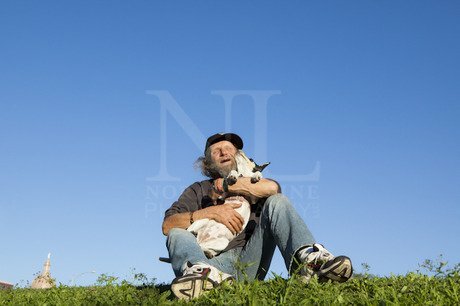 NL: Like my commissioned portraits, I was still photographing animals and people and my focus was on finding the joy that exists in the situation – but this was a new experience entirely. This project gave me access to a world I would most likely never have had otherwise. I wanted to photograph the subjects in their own environment. This resulted in photographing in camps in the woods, under bridges, on train tracks and in the streets. It was definitely challenging to work in some of the locations. I wanted to keep my equipment use fairly low so as not to overwhelm anyone. DT: What do you want this project to do? NL: I want this project to bring awareness of the importance of the human/animal connection regardless of economic circumstances and for the viewers of the photographs and the listeners of the audio vignettes to endorse programs that support this bond. ATA’s 4Paws program is one of these valuable programs.